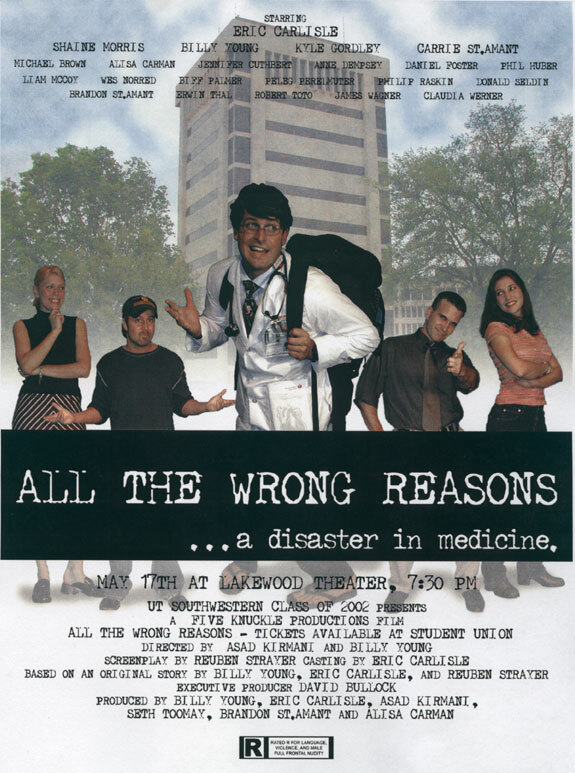 For over twenty years the graduating class of UT Southwestern Medical School has produced a senior film, generously funded by the school, viewed at a local theater just before graduation. 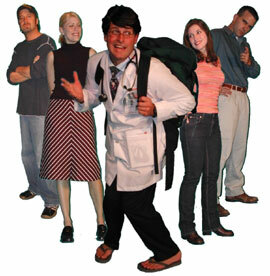 Traditionally these films have been a series of short skits, each one making fun of some aspect of medical school, joined together to make a 60-90 minute film. The writers, actors, and directors have come from the class while a professional film crew shot and edited the film. As in all things, the class of 2002 has taken a different and better approach. A small group of interested students was formed in the middle of the third year, and the three of us charged with writing the film decided that this year the film would be unified, feature-length movie. Billy Young and Eric Carlisle immediately began writing an outline of the characters and plot, which they submitted to me in late 2001. From this scaffolding I wrote a screenplay, below. A film crew was organized, consisting primarily of Billy Young, Eric Carlisle, Brandon St. Amant, Asad Kirmani, and Alisa Carmen. While I slowly churned out scenes, they began filming in collaboration with professional videographers paid for by the school, but early on it became clear that the professional group was limited by time and location constraints that wouldn't allow for us to make the kind of film we were interested in. Billy therefore took out a hefty loan and purchased a digital camera, associated production equipment, and an editing workstation (an iMac and Final Cut Pro). While we continued to use the professional crew for scenes shot on campus during the day, the majority of the footage was taken with Billy's camera. Seth Toomay took on the role of primary editor and as footage became available he and Brandon molded it into a finished product. This film was conceived, written, cast, acted, shot and edited entirely by the class of 2002, and what's more primarily by a small group of us not known for our discipline and productivity. At one point I was writing; Eric, Billy, and Asad were shooting; Seth and Brandon were editing and Alisa was planning tomorrow's shoot all at the same time. The finished product, which is more or less but not entirely consistent with the screenplay, is available from the UTSouthwestern student store on VHS cassette and DVD. The screenplay is available here as a series of scenes in html format, as a complete 500K html document, and as a complete Microsoft Word document. The screenplay is based on scene descriptions written by Eric and Billy. This is a late incarnation, which I responded to with a letter to Eric, Billy, and Asad, detailing my own ideas and laying out the structure of what would become the script. We were very nervous about the school censoring our film, so I wrote a letter to a senior bureaucrat pleading our case. On the night before the big night, Billy came home drunk and motivated to express his gratitude. The program from premier night. We spent the final week of production locked up in Seth's apartment doing the final edit.